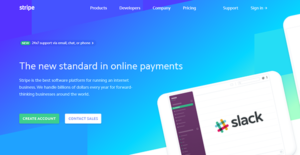 Stripe is a cloud payment platform designed to help you accept and manage online transactions. It gives you an end-to-end solution with features to process online payments, making it ideal for e-commerce or web-based businesses. At its core is a robust payments engine that streamlines the movement of money in your business while connecting with applications that enable you to prevent frauds, manage revenue, and drive global business growth. The platform uses a cloud-based infrastructure to allow scalability and to tighten security. It removes the complexity of financial operations in online commerce by leveraging the platform to work with financial institutions, banks, payment networks, regulators, and consumer wallets in place of your business. Stripe offers various products to address crucial stages of your payment processes. The fully integrated global payments platform offers an all-in-one solution to cover your payment of accepting, processing, settling and reconciling, and managing payments. Some features that cover this include customer interfaces, payment options, fraud and disputes, revenue optimization, and business operations, among others. It also has billing models designed for fast-growing businesses. This enables you to bill customers with a one-off invoice or on an automatically recurring basis. Additionally, it has a service for marketplaces and payments platforms to use in accepting money and paying out to third-party systems. This makes it possible for Stripe to work for any business model as mentioned through its simplified infrastructure with pre-made UI components and an API-first approach for customization. You can support the payment gateway preferred by your customer as Stripe offers a variety of options. Go global by processing payments for all major credit and debit cards in every country. Digital wallets such as Alipay, Amex Express Checkout, and Apple Pay are available for customers who want a convenient way to pay without sharing their card information. It also supports local payment methods, customer’s preferred currencies, and local Stripe accounts. When it comes to revenue optimization, Stripe optimizes routing paths through direct integrations with card networks like Visa, MasterCard, and American Express. This pre-processing layer reduces transaction latency and improves success rates. It also adds an additional layer of authentication to avoid fraud risks and chargebacks. Dispute handling is automated as well to efficiently submit evidence in case of conflicts. Financial reporting, consolidated reports, and automated accounting support accelerate and streamline reconciliation of transactions. This gives you charge, fee, transfer, and refund information in real time through Stripe’s API and Dashboard. Once a transaction is settled, these also expedite and simplify how you get paid from unified payouts. You can also manage payout timing and multicurrency payouts. Meanwhile, you can have a unified view of charges across various currencies, types, payments, and countries from Stripe’s real-time reporting and data exportability. If you are considering Stripe it could also be beneficial to check out other subcategories of Best Payment Gateway listed in our database of SaaS software reviews. Each company has different requirements and needs an application that can be personalized for their size, kind of employees and clients, and the particular industry they are in. For these reasons, no platform can provide perfect tools out-of-the-box. When you search a software app, first be sure what you need it for. Read some Stripe reviews and ask yourself do you desire basic tools or do you want sophisticated tools? Are there any industry-specific functionalities that you are seeking? Find the answers to these queries to assist your search. There are multiple aspects that you need to consider and these include your budget, particular business needs, your company size, integration requirements etc. Take your time, try out a few free trials, and finally zero in on the system that presents all that you require to enhance your company competence and productivity. Stripe offers a simple and straightforward pricing scheme. It has no setup or monthly fees. Instead, you only pay when you use the service. The pricing rate is simply 2.9% + 30¢ per successful charge for credit and debit cards. For the price of other payment methods, you may refer to the vendor’s pricing list. It also offers an Enterprise package which comes at a price quote basis. Contact the vendor for details. For disputes, disputed payments incur a fee of $15. This fee is fully refunded if the customer’s bank resolves it in your favor. We realize that when you make a decision to buy Payment Gateway it’s important not only to see how experts evaluate it in their reviews, but also to find out if the real people and companies that buy it are actually satisfied with the product. That’s why we’ve created our behavior-based Customer Satisfaction Algorithm™ that gathers customer reviews, comments and Stripe reviews across a wide range of social media sites. The data is then presented in an easy to digest form showing how many people had positive and negative experience with Stripe. With that information at hand you should be equipped to make an informed buying decision that you won’t regret. What are Stripe pricing details? What integrations are available for Stripe? Pros: I’ve been using Stripe from the very beginning, and they have really improved they product. I have a feeling that the product is made by developers for developers and I really found it useful. This product is number one for me when it comes to payment gateway. To be honest, I wanted to change the product but I have always ran into poor documented tools, useless process and poor interface, and Stripe is beyond that. Cons: There is nothing to dislike for the software technical implementation, but I remember a time when I have created an app that was very successful and I have received thousands of dollars in short time and they even froze the account because they thought it was a fraud, and it took some weeks to resolve the problem. But, I cannot put the blame on them. Pros: Nothing, they don't give any docs for developers or marketers for how to deal with the API or any legal actions concerning the disputes and refunds. Cons: The main problem is they are not dominating their own business, because they are only partners of some banks, and their banks only give the total right to the buyer even if you getting scammed by your own buyers, you can send all the evidences you want, the buyer always wins.